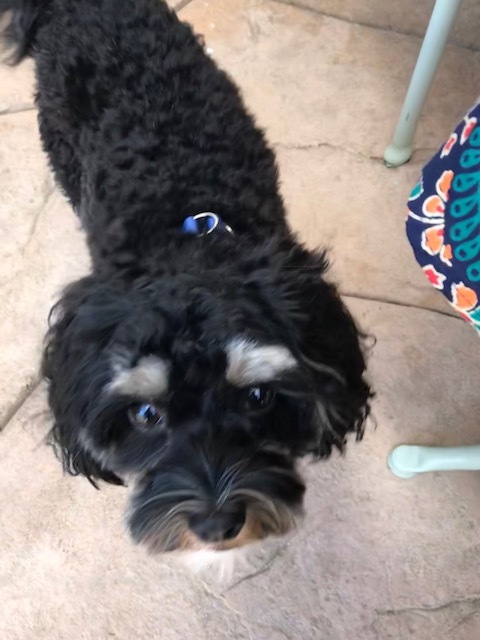 This Memorial Day Weekend, Cammie, my brother and sister-in-law’s dog came to visit. Cammie is almost two-years-old now, and she has more lighter colors on her face and paws, so now you can see her eyes better 🙂 She was a lot of fun to have around this weekend. We played ball in my parents’ garden. She did get a stomach the first night here though 😦 My brother and sister-in-law thinks it was from the macadamia nuts she eat from the tree in our garden. But she was feeling much better on Sunday, happy and wagging her tail again. Saturday, we watched the NBA Western Conf Finals on TNT because my brother and I are Warriors fans. I am pretty sure Game 7 tonight at Houston is gonna be stressful especially for my brother. On Sunday, we all went to the harbor for lunch. My brother and I had the salmon fillet, Mom had the mahi-mahi, Pop had the original fish n chips, and my sister-in-law had sharkfish n chips. The meal was alright but a bit overpriced. There were a lot of people at the harbor, and when we left the line long all the way to the parking log. My brother has been on the paleo diet; he is taller and even skinnier than me, and he has to eat rice so he won’t lose too much weight. I need to try this diet, because I have been gaining weight since 2016. But it is so hard especially with the bipolar; it gives me a headache just thinking about cooking, but maybe I can find easier ways to prepare those gluten-free foods. My parents do all the cooking, which is mostly Filipino food and rice. So, maybe, just try not to eat rice for awhile and stick to the meat and veggies? LOL. As far as the rest of my health issues… I started a low dose of Cymbalta, which is an antidepressant that is also used for chronic pain, but my anxiety got worse when I was on it. So, I stopped taking it. I guess I will just take Tylenol and muscle relaxant as usual PRN–when the pain is really bad and I have more trouble sleeping than usual. The pain makes me so tired sometimes. I have been cutting back on WoW, for one thing there’s nothing to do until the new expac is released on Aug 14th. If I need to something to do other than reading and listening to audiobooks and watching TV, I work on leveling my Lightforged Draenei Paladin for the heritage armor. Let me just say, Prot/Ret Pally is the most boring tank/melee class I’ve played ever. But it’s just an alt, so NBD. Other than that, I still think about my writing everyday, though I haven’t done much, just been noting down all my ideas. I am in a bit of a good mood, which I don’t expect to last long. I got a massage yesterday, and it felt so good because my shoulders are so tight and knotted. I am going back next week for more. It’s just something I need right. I am still having trouble sleeping. Partly because my shoulders hurt, but also because I have so many worries and anxieties and think too much. My therapist thinks that if I work through all the things I carry inside, if I process my stuff, I can get closure and heal. I don’t even know what healing feels like. I seem to equate it with weakness or something foreign to me because I don’t believe I’m innately a real good person, I’m not spiritual or anything, and I have this weird ego. I feel so fake just saying that word, healing. How can that be me? Healing sounds like something only positive people and like really kind and spiritual people do. But I am just sick of having all these secrets and not feeling strong inside. Of not owning my story and taking in pride in it. I talk about my parents and my deep resentments in therapy a lot. I feel unhappy because my parents never change. Even though I know they love me and mean well, I don’t like the way they show it. They worry about me so much it irritates me and makes me feel guilty. And they’re so pushy that sometimes their advice feels like criticism. They tell me when I’m gaining weight and what they think I should eat and what I should to to lose weight. Now, they want me to drink a tea from Thailand made from blue flowers because they saw a Filipino guy on TV who said eating the flowers got rid of his bipolar. I know they want to help me, but sigh… no blue flowers are gonna magically cute my illness. Plus, it doesn’t taste like anything or make me feel warm and good inside like the strawberry white tea I normally drink. It’s actually a green tea which I love. Tastes so good. Anyway so I’ve decided that since I can’t change my parents, I could try changing my emotions and behavior when they irritate me. Lately whenever I feel bad or guilty about being grumpy toward them I end up feeling I have to do something nice for them or make it up somehow. Like I try really hard to be patient when my dad starts talking even though I really don’t want to talk or care about the conversation. Idk why but I get so easily triggered when my parents communicate because I don’t feel invested in 90% of their conversations. Especially my dad who goes on and on with trivial things I couldn’t care less about. Plus, he’s always buying stuff just because it’s on sale and showing it to me like it’s some kind of treasure when all I see is clutter and not only that but it pisses my mom off because she thinks he’s wasting money and just takes up space in the house and my dad leaves all his mess around. Lol. Family. So, now, my thing is to try to just accept it and try not to get irritated or snap at my parents and be nice. Then I won’t feel so guilty and bad about myself. Lol. Because they never hear me anyway. And I have never felt comfortable talking to them about my feelings. I especially can’t talk to them about my secrets. Creativity comes and goes. I’m not sure if it’s related to my mood or my medications. Probably a little of both. Many people with bipolar disorder think that their bipolar meds–mood stabilizers like Lamictal or Lithium–stunts their creativity. I have been taking Lamictal for ten years, and for a few years also had been taking Lithium, which made me fat. Anyway, I was rather unstable at the time, and also taking an antidepressant. My moods were all up and down, but I managed to do some writing. It wasn’t very good writing, but I was writing anyway and almost finish a book. I gave up on it because I just couldn’t figure out the ending, and though I believed in my characters I didn’t believe in the plot. So, now, my disability is up for review, and I am anxious and worried that I might lose my benefits–disability income and Medicare. When I had first applied for disability in 2009, I had been having trouble working. I had quit my lost job in 2008 on the spot, after frequently calling in sick and showing up late, and going on temporary disability twice in 2007. I had been hospitalized in 2007 for ten days for a mixed manic episode and had difficulty returning to work. After I quit my job, I received either unemployment compensation or State disability benefits for about year. It was awhile ago, and I can’t remember. But it must have been State disability, because I was immediately approved for SSDI in 2009 and and received a retroactive lump sum going back to the date SSA determined I was first disabled. I don’t think I am ready to go back to work, and I don’t know when I will be. I think I have a serious mental illness, and now I have arthritis which limits my activities. Now, I am feeling depressed and angry with my parents because they think I should just get up and get a job and go to work. Just because I look fine on the outside doesn’t mean I am okay. My parents really don’t get it. When I was a kid, I used to wish I hadn’t been born. Like if I had a choice, if anyone had asked me if I wanted be a sentient human being, I would have preferred not to exist. I realize I must sound very negative, but I feel like there is nothing special about me, nothing special about my life, and no special love. I have many interests but not much passion for anything in particular. I really wanted to write a book, but I haven’t been writing anything. When I was growing up, my primary ambition–my quest–was to write a book and get published. That was it. I didn’t think about getting married and having kids. But I have noticed over the years that I am usually happier with my life when I am in a good, stable relationship. Anyway, I am thinking maybe I need to go back on Abilify, because I seemed more active and motivated then, when I was taking it. And I want to talk to my therapist again, because I stopped seeing her when I was doing physical therapy for the arthritis, and I am feeling angry and depressed and anxious again and as I mentioned above thinking that I shouldn’t have been born because lately I haven’t been feeling motivated to do anything except the most basic things in life. Of course, I still enjoy my TV shows and audiobooks, and I started playing WoW again, just an hour a day or so because of the arthritis and my neck and shoulder pains. Of the TV shows I have binge-watched these past few months: Supergirl, Shadowhunters, The Crown, Poldark, and Harlots. I watched Poldark twice in fact. I can’t wait for season 3, and I hope Harlots will get a season 2, because I really want to know what is gonna happen next. Other than that, most of the time I just wanna stay in bed. Oh and watch prime-time MSNBC, especially The Rachel Maddow Show. That’s it for now. I probably won’t blog again until I receive news about my disability review. I hope my creativity will come back. I just wish that I could have had a normal and happy life when I was growing up. Maybe I would have been stronger and well-adjusted. Maybe I would have written half a dozen books by now. Maybe I would have a passion for life and feel like a have a reason for living and maybe I would want to go out and be around people and do purposeful things. But whatever. I haven’t talked to my mom since yesterday. I am still feeling resentful and angry about what she and my dad said. Oh, I’m sure they mean well, but they just have no clue what it means to have a disabling mental illness. So, I’m not getting much sleep again. Anywhere from 3-5 hours. A lot of mentally ill people have trouble sleeping. But this not sleeping streak has been going on for over a month now, and I’m pretty sure it’s not healthy. For people diagnosed with Bipolar Disorder, not sleeping isn’t good and could trigger a manic episode. Idk if I’m manic or just being super creative. I don’t feel manic. I’m not exhibiting rapid, pressured speech, and an exceptionally high mood. But I’ve been more active than usual, thinking too much, and being real project-oriented. It could be because Election 2016 has fired me up. Or it could be because I started taking an antidepressant, Abilify, which has an activating effect. Or it could just be that I needed some changes in my life. Whatever the case, I’m writing, playing WoW, being less irritated with my parents, socializing irl, updating my book blog, and blogging here. I even started to revise my MFA thesis into something publishable. I haven’t worked on it in about ten years! I hope with this attempt I finally finish revising it. One of my activities this month include the women’s volunteer group meeting I attended. My friend had asked me to do the Inspiration, which could be a quote, a prayer, an inspiring anecdote, anything that inspired you to volunteer. So, I read a couple paragraphs from Kay Redfield Jamison’s memoir of “moods and madness,” An Unquiet Mind. I talked about how Jamison realized when writing her book that love, not only Lithium, saved her, and how volunteering is a way I can save myself. Because volunteering, giving, is a form of love. And it also shows that I’m capable of self-love, which is pretty much essential if you want to survive your mental illness. By wanting to save myself it shows that I like and value myself enough to believe that my life is worth living. For my volunteer service this month I did a couple hours repainting a room at a transitional housing center for the homeless. I’m still having trouble sleeping (most likely due to my illness(es), mental health and chronic shoulder pain). I have been feeling restless, can’t relax, and was up late last night playing a new toon in WoW. I’m in a Facebook group called Women of Warcraft. Some of the ladies from the group decided to start up a Horde guild for women only. So, I rolled a troll druid, because I always wanted a troll druid LOL. 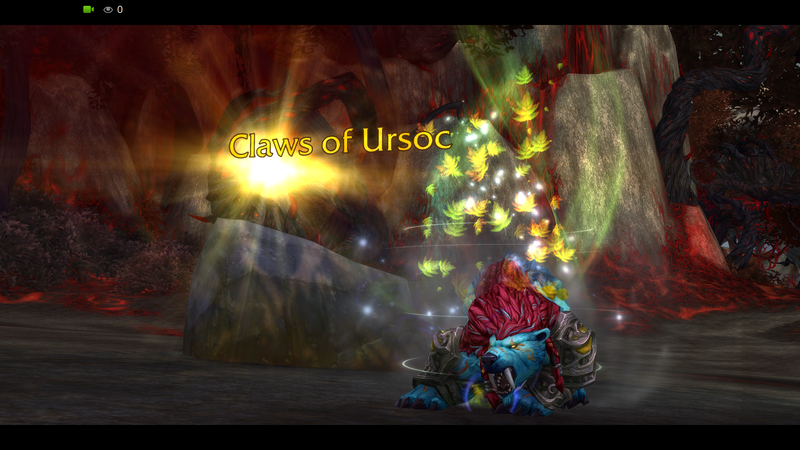 Here’s the screenshot of my troll druid bear artifact weapon, Claws of Ursoc. It basically just changes her shifted form into an even more shaggier, fiercer, (and colorful!) hulking bear. My troll has light blue skin and a fiery red-yellow mohawk. Just when you thought it couldn’t get worse, #2016 yet again snuffed out another bright star in the galaxy, but for many fans Carrie Fisher will live on in their own light. I will remember Carrie Fisher not only as the fierce, heroic Princess Leia in Star Wars, but also as a mental health advocate who spoke about her battle with Bipolar Disorder. I can tell you many of my mentally ill friends looked up to her and admired her, because she was one of us. Fisher has been unusually outspoken for years about her mental health battles, something many fans mourned when Fisher died at age 60 on Tuesday after suffering a heart attack several days earlier on an airplane. The actress talked candidly about bipolar disorder and her treatments and how they affected her life. She acknowledged there was still a stigma when talking about mental health, but she wanted to help fight it. “I am mentally ill. I can say that. I am not ashamed of that. I survived that, I’m still surviving it, but bring it on,” Fisher told ABC News. My story is a little different. Though I am no longer ashamed about being diagnosed with Bipolar I Disorder and having been hospitalized multiple times, I have felt shame and embarrassment about being so ill and disabled. I dislike feeling vulnerable and weak, and I also felt guilty and unworthy of sympathy. I was living in the Bay Area when I was first hospitalized, I was no longer able to work, and I soon ran out of money to pay for my health insurance and treatment. I didn’t want to go home so I borrowed money from my parents.